£9.99 per copy / £7.50 concessions. All proceeds to St Mary’s Church. 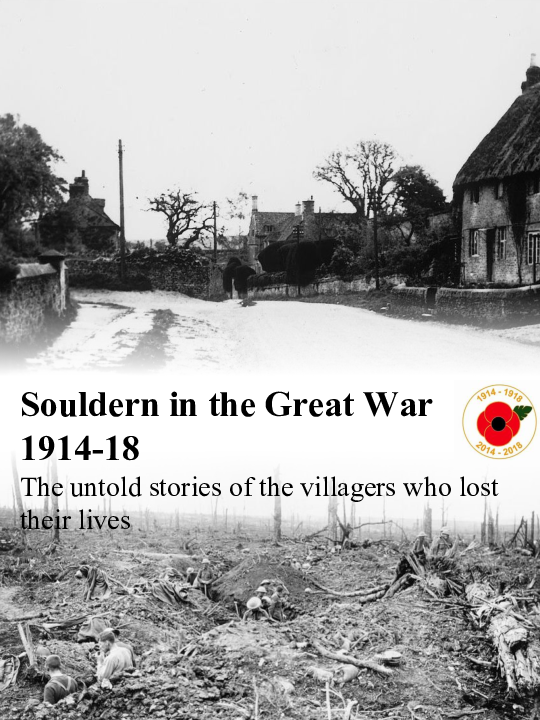 In 1911 the population of Souldern was 396 with just under half that number being male. A total of 75 men either living or born in the village left their homes to fight for King and Country between 1914 and 1918. Tragically 17 would never return. Generations of villagers have found themselves sitting in the church of St Mary’s, Souldern gazing at the memorial plaque commemorating the war dead from 1914-1918. Like so many before us, the authors of this book feel an immense sense of gratitude to those faceless names looking back at us. We wanted to find some way to recognise their great sacrifice and pay homage to the village that has thrived so wonderfully in the 100 years since the end of the First World War. This books tells their story, using the wide array of materials that are now available to modern researchers. From their beginning in or around Souldern through to their deployment across the various fronts in World War 1, it covers their stories including their fighting, and ultimately dying, for King and Country. 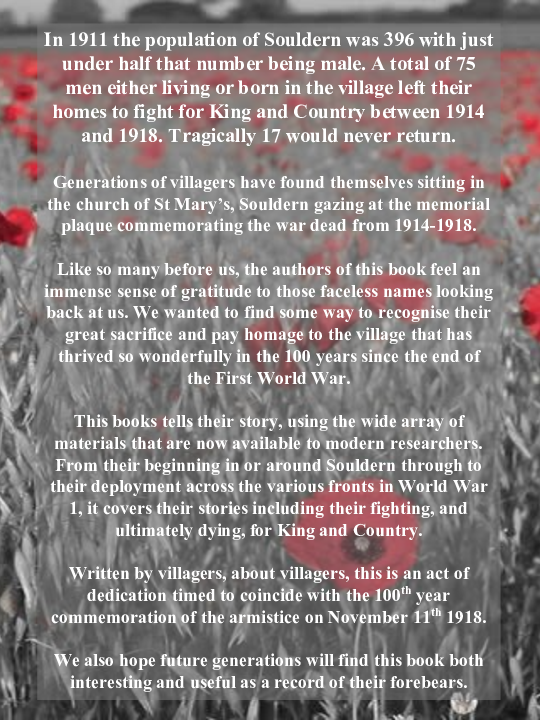 Written by villagers, about villagers, this is an act of dedication timed to coincide with the 100th year commemoration of the armistice on November 11th 1918. We also hope future generations will find this book both interesting and useful as a record of their forebears.